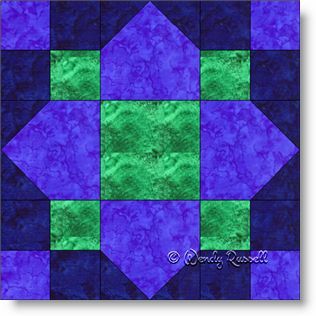 This quilt block -- Quatrefoil -- is one I had never heard of before. I like to discover new blocks to bring to your quilting experience. How nice that this is an easy block to construct, especially when you don't have to use a single triangle to make it! I have chosen to make this nine patch pattern using the "sew and flip" method for the corners of one of the patches. There is a little bit of waste in fabric, but the ease of construction makes it worth it. So, you will find an extra page in the pattern with directions on how to create this specific patch. Once in a while I like to deviate from a lighter background fabric and use a dark one instead. (Men seem to like these types of quilts.) The sample quilts illustrated show you two different settings for your quilt. Enjoy!